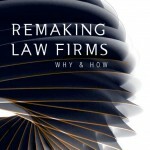 Today’s post is by Jordan Furlong about his new book, ‘Law Firm Strategy in a Buyer’s Market’. This is the fate suffered by most law firm strategic plans: to serve as the organizational owner’s manual, pulled out in the event of a crisis but otherwise stashed away with the ice scraper and the map of Philadelphia. Now, if your firm’s goal or purpose is the same as most firms’ — to maximize profits for ownership in the short-term — then your firm will adopt a strategy by which that purpose can be fulfilled. 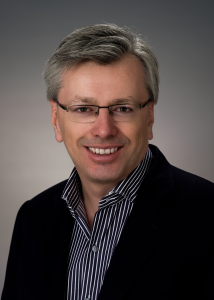 Its strategic plan will focus on how the firm can constantly grow its market share, how it can encourage more billable work from associates and non-equity partners, and how it can attract lateral equity partners with attractive books of business, all in order to increase overall partner profit levels. If the purpose of a law firm is to make loads of money for its owners, then a rational strategy for such a firm will set out to do just that. The strategy probably will pay incidental attention, at best, to client service or process improvement or cultural enhancement, because these things don’t maximize partner profitability in the short-term. This is the kind of strategy a law firm can afford to adopt in an uncompetitive and undemanding seller’s market. It’s a seller-first, lawyer-focused strategy. That’s why so many traditional firms, which came of age in such a market, seem to have one of these strategies factory-installed. Deploying this kind of strategy in a buyer’s market, however, is the equivalent of taking a short but exciting drive off your local pier. A seller-first, lawyer-focused strategy in a buyer-first, client-focused market gets it fundamentally backwards. It tries to push a vision outwards from equity partners’ objectives, rather than letting one flow inwards from market needs and buyer interests. In most law firms, this over-riding force applied by equity partners is too powerful to overcome. It invariably bends the firm’s strategy back towards these partners’ interests, the same way that light bends back towards a black hole. Nothing, not even market realities, can escape the gravitational pull that equity partners and their desires exert over a traditional law firm’s strategy. A law firm strategy founded upon its lawyers’ personal interests will always be a case of supply in search of demand. Law firms in the new market need to do better than this. They need a purpose grounded in the people and businesses they want to serve, and they need strategies that will enable them to accomplish that purpose. They need to make their clients the subject, not the object, of the firm’s existence and purpose. Everything that law firms conceive, plan, and carry out should be done within a framework and towards the goal of helping clients in their chosen markets achieve their goals , by anticipating and addressing their legal challenges and opportunities. Law firms’ strategies must be designed to achieve this purpose. A law firm that exists to serve the interests of its clients, therefore, needs a strategy oriented towards and dedicated to those buyers. The law firm must be about helping its clients get the legal services and solutions they need. So the strategy needs to be about client service. But hang on. A law firm can’t survive on great service alone. Realistically, it also needs a strategy to govern its activities in the marketplace as a competitive business entity, because as wonderful as client service is, it won’t pay the bills by itself. So the strategy needs to be about competitiveness in the market. And now that you mention it, the firm can’t direct all its attention externally. Who and what constitutes the core of the firm itself? We also need a strategy to govern the firm’s internal behaviours in order to better serve clients and compete for business effectively. So the strategy needs to be about the culture of the firm. Alright, then, so which is it? I think it’s all three. A law firm strategy needs to address and function in three separate but intrinsically related dimensions in order to fulfill its purpose. 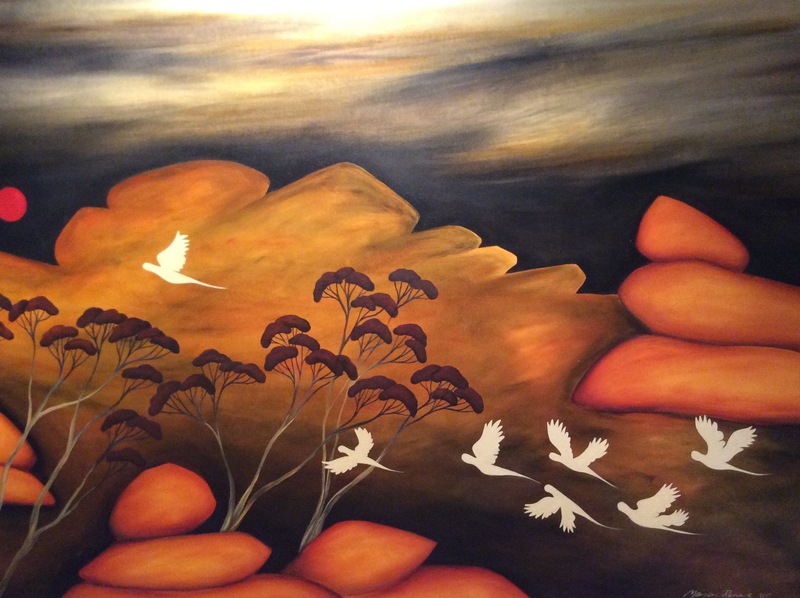 The first and most important strategy focuses on serving the needs and interests of buyers. This is the Client Strategy, because it keeps the firm’s attention primarily attuned to who its clients are, what they’re doing, what they care about, and how the firm can address their legal issues. The second strategy focuses on ensuring the firm is competitive in the markets and with the clients it wishes to serve. This is the Competitive Strategy, because it directs the firm’s efforts to sustain and grow a strong competitive advantage in the markets it wishes to serve. The third strategy focuses on developing and maintaining an internal culture that will support both the firm’s client service and its competitiveness. This is the Cultural Strategy, because it governs the firm’s ability to attract and keep the right people and install the best systems to serve clients and strengthen competitiveness. Most current law firm strategies take a little from each of the Client (“What are our markets?”), Competitive (“How do we grow?”), and Culture (“How do we compensate?”) categories. They roll them up with an aspirational mission statement or motto along the lines of “a relentless focus on excellence,” and they call it a day. Install and maintain a healthy and productive internal engine at the heart of the firm. This higher level of infrastructural complexity and institutional management isn’t some leap into an undiscovered country of complex corporate management. Rather, it’s simply the overdue arrival of law firms into what has long constituted the completely ordinary management of professional businesses. Many law firms generate hundreds of millions of dollars in revenue every year. They are complex businesses crafting multi-dimensional solutions for their clients’ high-stakes matters. They can’t be operated like grandly isolated fiefdoms of individual law practices any longer. 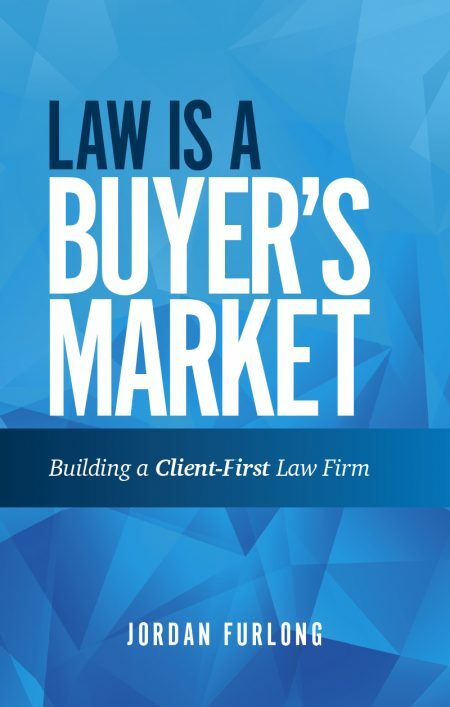 This post is an excerpt from Law Is A Buyer’s Market: Building a Client-First Law Firm. Jordan Furlong, a legal market analyst and consultant who forecasts the future development of the legal services environment. For more information or to order a copy of Law Is A Buyer’s Market, visit law21.ca/books. 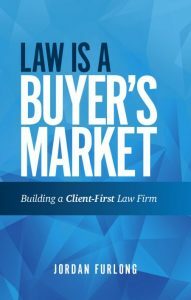 Last year Jordan published Law Is A Buyer’s Market: Building a Client-First Law Firm, featured in this post.